Personalized gifts have always been one of my favorite items to give and receive. There's something special about opening a box and knowing it was made just for you. When Gabe and I decided to get married, one of the first things I did was shop on Etsy for unique personalized wedding items. Without knowing what I was looking for, I came across a shop named Baby Puppy Designs and fell in love with every item in this store. I knew without hesitation that we had to have a custom cake server and forks for our wedding. What took me some time was figuring out what I wanted to imprint. We ended up with "we chose forever" with our names and date on the cake server and i do, me too along with the dates on the forks. There are so many options for personalized wedding silverware available at Baby Puppy Designs. I want to incorporate so many of them at our wedding. Silverware for the parents and bridal party, even wine charms (ps, the wine charms in this collage are ours!). Baby Puppy Designs offers much more than custom wedding items. 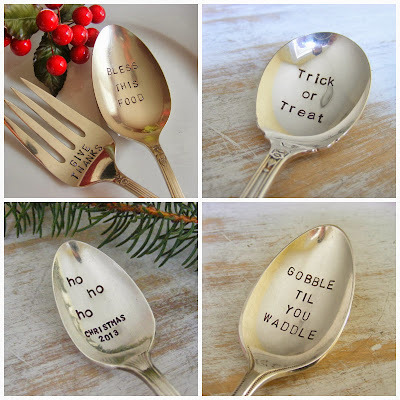 There is a 12 days of Christmas spoon set that has my name on it. I just need a bigger house so I can start entertaining again for the Holiday season. I am a self proclaimed Soup Nazi so when I saw the No Soup For You spoon set, I knew what my next purchase will be. How about the Cereal killer set! This shop is plain genius. I absolutely love all of the vintage hand stamped silverware. It's unique and classic at the same time and would make the perfect gift for anyone. 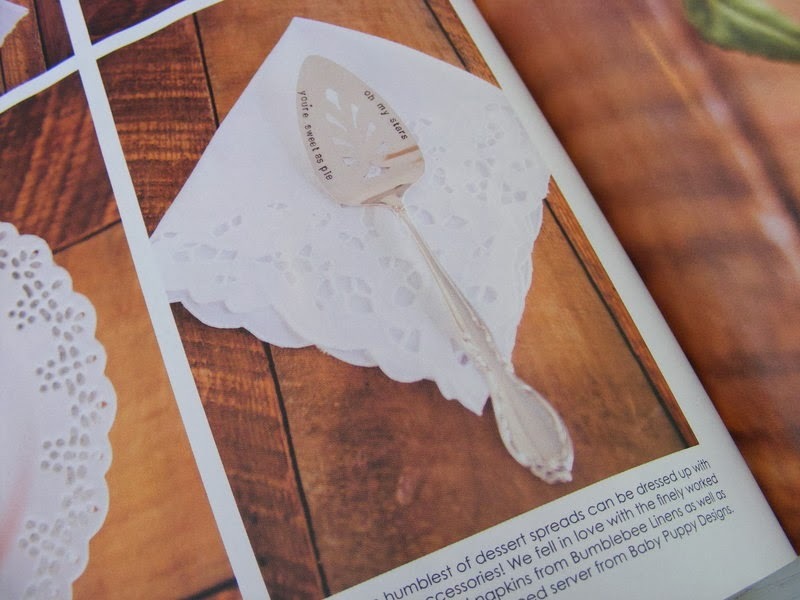 Baby Puppy Designs was even featured in Southern Wedding Magazine! Giveaway! Baby Puppy Designs is giving away one cake server and fork set or other product of equal or less value to one of my very lucky readers! Visit their Etsy store by clicking here and let me know in the comment field below which of their items you love most. Warning - I spent a good 30 minutes strolling through this online shop! Also, be sure to log your entries in the rafflecopter widget below as that is how I randomly select a winner. Once you comment, you will have an opportunity to gain additional entries. I love the eat, drink and be merry spoon! LOVE the wedding cake forks! I love the gobble till I waddle spoons! I'd also love the I do, Me too set! 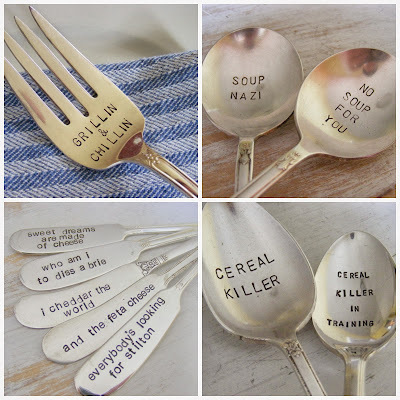 "no Soup for You" and "Cereal Killer in Training" LOLLL So funny! That 'gobble til you waddle' spoon is hilarious!! I would love the cake knife and fork set for our wedding!!!!!!!!! I love the one you too choose-both design and saying! The cereal killer spoon is hilarious!! I love ice cream or maybe a mr. mrs for my cousin getting married in December, or the soup nazi... or thanksgiving serving set... Man I love it all!! for my Mom, especially since she is so far away and I miss her like crazy. This stuff is SO flippin cute. I'm obsessed with all the fun and humorous ones...especially "Who am I to diss a Brie" and "Soup Nazi." Too funny. 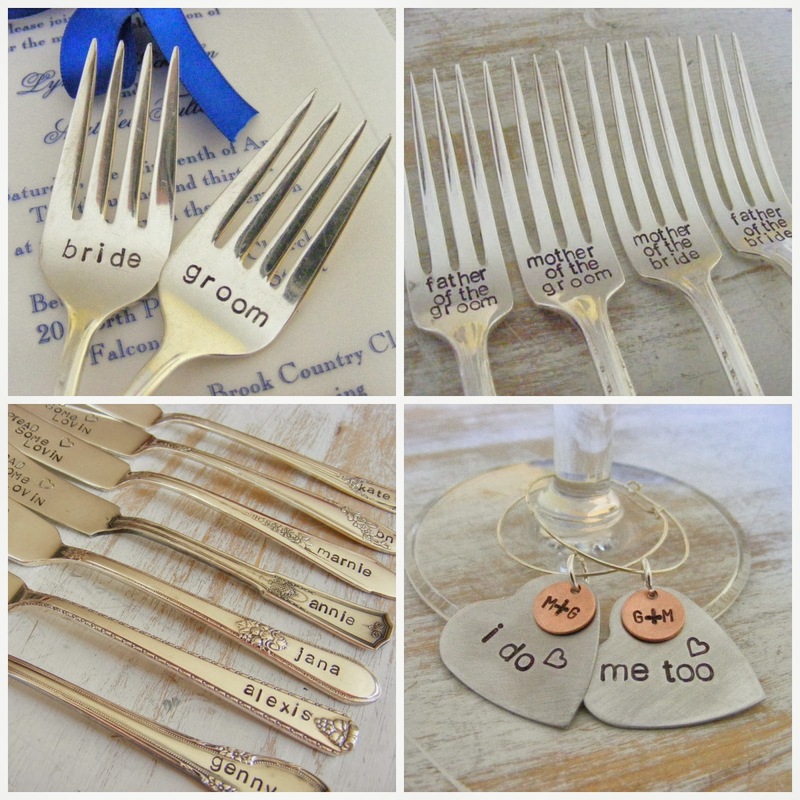 I love these spoons, "I do me too wedding forks with heart stamp"